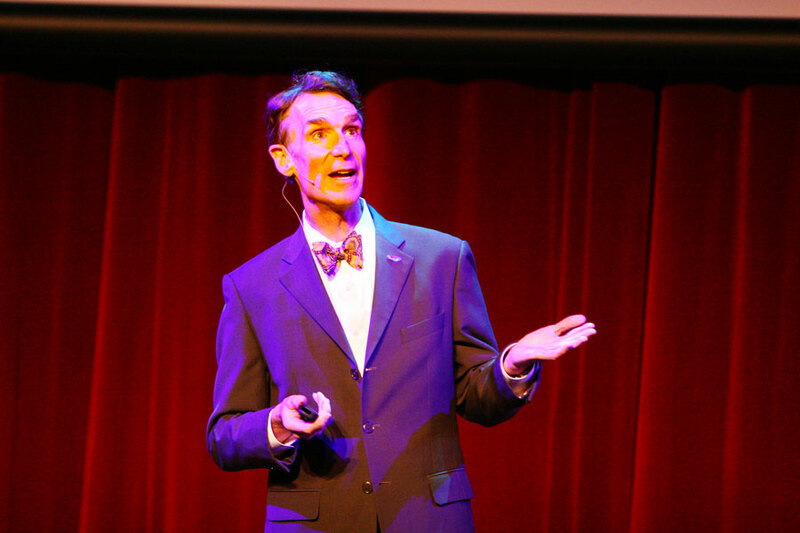 Bill Nye, known for his television show Bill Nye the Science Guy, spoke to a full Bovard Auditorium on Tuesday night about climate and global changes with his signature humor. During the lecture, Nye fainted but woke up shortly after. Though Nye was visibly shaken, leaning on the podium for support and eventually sitting down, he finished his lecture. “The joy of discovery, my friends, is what science is all about,” Nye said. Nye discussed mainly climate change and the issue of rapid global warming, but drew on examples from the climate of Venus to North Dakota windmills. “This is not, as I like to say, rocket surgery. This is people not paying attention to what’s going on,” Nye said. 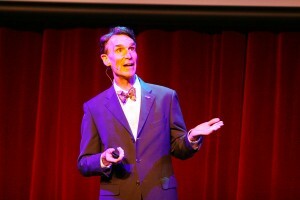 Addressing the audience as the “climate change generation,” Nye presented students with facts and solutions for the current climate situation and emphasized students’ abilities to change the world, particularly through technology. “You guys can invent technology that could — dare I say it? — change the world,” Nye told the audience. Nye balanced the lecture with humor and facts. Nye spoke in dramatic voices and one-liners, reminiscent of his popular television show. Audience members applauded Nye for resuming his lecture after fainting. “He kept trying to finish his speech though it was clear he was really woozy, and he did finish from a chair. What a trooper,” said Pierre Tasci, a sophomore majoring in engineering. After the lecture, the audience gave a standing ovation and chanted “Bill,” a tribute to his show’s theme song. Bill Nye the Science Guy, ran on PBS from 1993 to 1997. The popular show aimed at teaching different scientific concepts to its audience. “I remember the little episodes; it was all do-it-yourself, [so] you didn’t need a kit. I remember the funny voices he did, his kid helpers, the cool sets he had … I wondered how things worked, and he explained it,” Sidhom said. Corrine Tom, a junior majoring in biomedical engineering, said she would love to have Nye as a professor, and enjoyed his lecture. “I thought it was really awesome; really seeing him in person was wonderful,” Tom said. “[The lecture] was interesting — he brought in a lot of stuff from the show, like quirky voices. It was really cool to see one of my childhood heroes,” Sam Lin, a senior majoring in biomedical engineering, said. 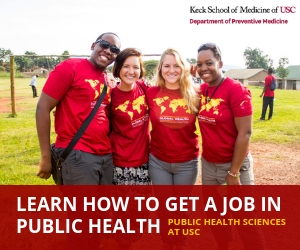 The event was organized by the USG Program Board’s Speakers Committee and Academic Culture Assembly. Nye’s lecture lasted about 45 minutes, but the question-and-answer session was cancelled because of concerns about his health. Some students lined up more than five hours before the doors opened just to see Nye speak. “I love Bill Nye. He taught me English … and science, too. I’m ready, front and center,” Richard Sidhom, a freshman majoring in philosophy, policy, and law. Sidhom was the first student in line, arriving at Bovard at 1:45 p.m.
Arya Shah, a freshman majoring in neuroscience, had been in line since 3:30 p.m. Program Board organizers said Nye fainted because of exhaustion, but was not taken to the hospital. I was sitting in the audience and the reason why the news outlets are reporting that people didn’t immediately respond is because Bill was down for about 10 seconds and the entire audience initially thought it was part of his comical presentation. He got back up on his own and insisted on continuing the final fourth of his presentation. As soon as it was determined that he was seriously in danger, he was offered assistance. At the end, he was taken backstage and immediately offered food and given professional medical attention. USC and all of the students and staff in attendance did the best job they could have done given the unexpectedness of the incident and Bill’s desire to fight on and finish the speech. I know I speak on behalf of the entire Trojan family when I say that we are incredibly supportive of Bill and are deeply concerned about his health. Please take the time to understand the situation before accusing the university or its students of inaction. I was there, close to the front. It wasn’t that no one was willing to help, everyone was very concerned, but because he is such a funny guy we all didn’t know what was happening– if he had fainted, had something more serious, or if it was part of the performance. It became clear that he had really fainted, but because he was only down for 10 seconds we were all really shocked and not sure what do to. And everyone around me made an effort to not tweet, post it on facebook, or take pictures out of respect. This guy was our hero, and a big part of our childhood. Don’t accuse us of being careless spectators, when students were the ones that called out for him to get a chair, food, and water. It’s happening everywhere. I can’t explain the young generation actions. To begin with devices should not be allowed as cameras are not allowed in the court room. I am embarrassed and horrified at our younger generation. What is wrong with you people. To busy to help out a fellow human being? He could have died while all of you were sitting there tweeting or taking pictures. You should all be expelled!! There wasn’t really anybody tweeting and taking pictures when he fainted. that was a deliberate exaggeration by one person who was quoted by all the internet news sources. He was only down for a couple seconds, then he hopped right back up. the fact that the event staff did not react to it initiially made it seem like part of the act. his presentation had been so energetic that it seemed totally plausible. I agree with you, Embarrassed. The fact that an audience of students, many if not most of whom had no EMT training, didn’t rush the stage to help a person who they were not sure was actually in trouble is definitely grounds for expulsion. If it was an older generation of audience members, I’m sure they would have jumped out of their seats and sprinted to the fallen speaker in the 10 seconds he was down. Having dozens of people who can’t do anything to help standing around certainly would not have caused any problems for the people who are actually there to help! I guess the younger generation just has to settle for doing reasonable things, like calling for help and telling him to sit down when he insisted on standing, which is exactly what we did when we saw one of our childhood heroes in trouble. but perhaps you also were too busy tweeting? Congratulations, Jennifer, you have mastered the one-sentence paragraph.